Late fall is always a busy time for enrollments as Girl Guides around the country learn to tie their ties, make friends with their new groups, and make their Guiding promise. Enrollments take many themes, often cooked up by our very creative girls. In this post we feature two groups who had fun making enrollment their own. Firstly, the 2nd Burnaby Mountain Sparks had a lovely rainbow themed enrollment where girls crossed through a rainbow arch before making their promise. The leaders got an awesome butterfly cupcake-cake to celebrate the occasion as well! They finished the event with a family sing-a-long, practicing the tunes that the girls would be singing for local seniors in a couple of weeks. And secondly, the 22nd Burnaby Mountain Guides had their enrollment with girls making their promises and then entertaining their parents with an elaborate Nutcracker puppet show that the girls had been working on for weeks ahead of time. They made the puppets themselves and enjoyed studying the story as it is preparing them for an outing to see the Nutcracker performed by the Goh Ballet coming up in December. Welcome to all of the new girls who joined Guiding in Burnaby Mountain this year! It’s still not too late if your daughter is interested in joining the fun. We accept new members all year round. More girls are still joining every week and there is still room in most of our units. The girls of the 1st Sparks recently enjoyed an outing to the Carousel Theatre for Young People’s presentation of The Very Hungry Caterpillar and Other Eric Carle Favourites. The show presented some of our favourite stories: The Very Hungry Caterpillar, The Mixed Chameleon, and Little Cloud. This production, designed for kids aged 3-7 years old, was perfectly suited to Sparks! The show used puppets and black light to tell the stories in a way that seemed truly magical. As a special treat, the puppeteers came on stage at the end of the show to demonstrate to the audience how the puppets are used. 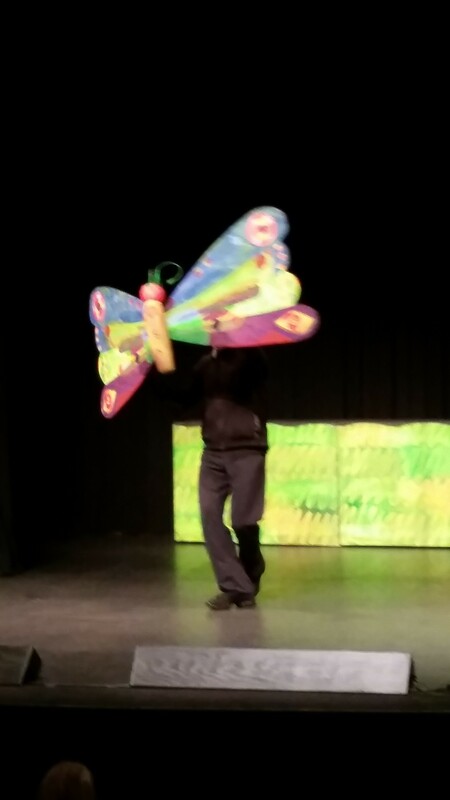 Almost unanimously, the girls’ favourite part was when the caterpillar turned into a beautiful butterfly. As part of regular weekly meetings, the girls prepared for the show by reading the stories and doing some Eric Carle inspired art. 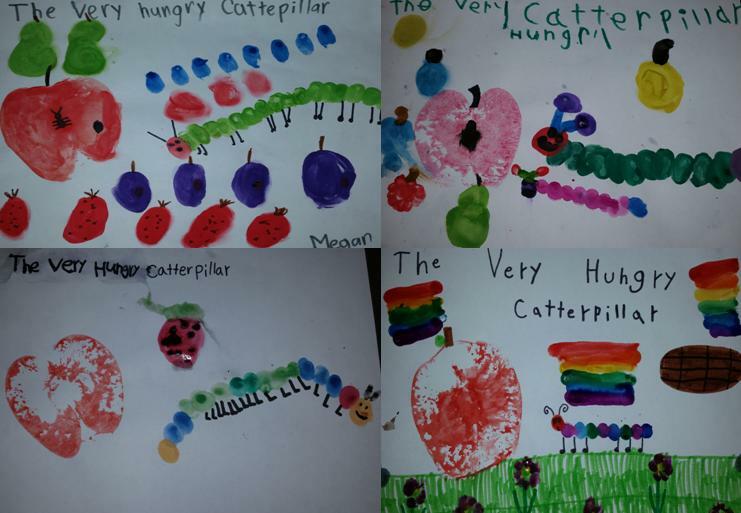 Check out some of their finger and fruit paintings of the Very Hungry Caterpillar. It was such a treat to see story books come to life on stage. 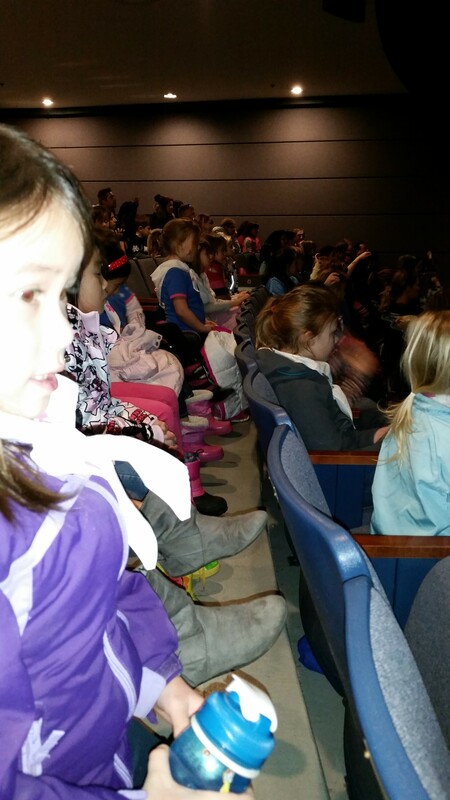 This outing not only introduced many of them to professional live theatre for the first time, it also prompted many of them to borrow Carle’s books from their school libraries. And who doesn’t want to see kids more interested in books? The outing was heavily subsidized by the unit’s excellent cookie sales. Way to go girls!